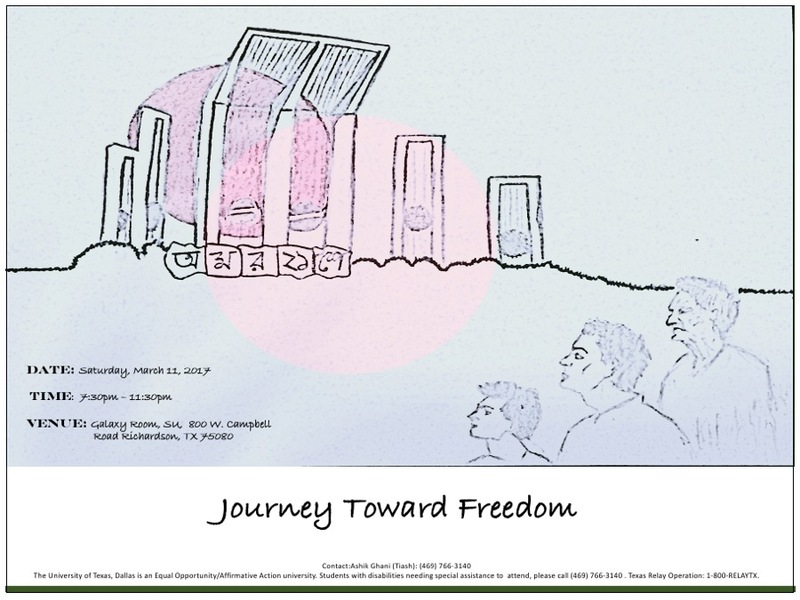 BSO at UTD would like to invite you to attend event Journey Towards Freedom, where we briefly portray the inspiring history of the birth Bangladesh from language movement to liberation. Various organizations along with BSO and community groups will have cultural performances in this event to represent their respective language and culture. BSO at UNT and UTA will also join us! We will also be serving traditional Bengali food and snacks at the event. Admission and food will be free for all UTD students/staff/faculty (please bring your comet cards). Admission fee for all community memebers is $5; food will be available for purchase. Please RSVP as soon as possible and contact Ashik sartaz Ghani or Salman Kabir if you have any questions.